Introduction:- Being a core Oracle DBA we have deep knowledge of Oracle Database Architecture. In any architecture, we go through the proper function. After having a good knowledge of database architecture we must work beyond of it. In this article, we are going o have a tour of Oracle Application R12c architecture. This architecture is totally different from Oracle database’s architecture. A tier is a logical grouping of services potentially spread across more than one physical machine. 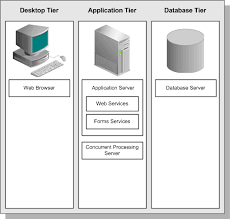 The three-tier architecture that comprises an Oracle E-Business Suite is made up of the Desktop Tier (The Client Interface), Application Tier (Various servers and service groups that process business logic), Database Tier (Oracle database server). Sun 1.5 Java Runtime Environment (JRE) i.e. 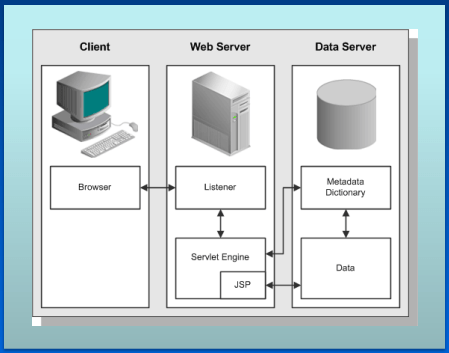 The Web listener component of the Oracle HTTP server accepts incoming HTTP requests from client browsers and routes the Requests to the appropriate OC4J container. 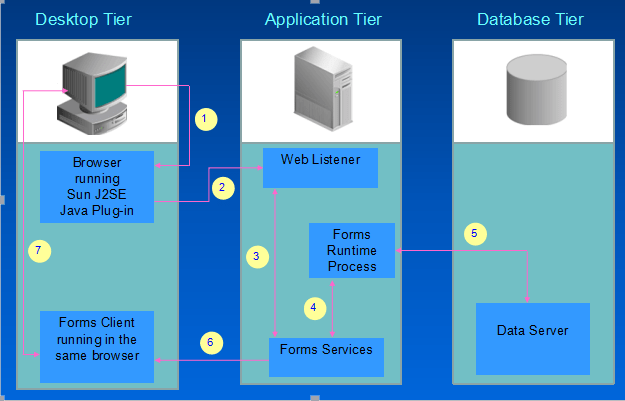 Forms services in Oracle Applications R12 are provided by the Forms Listener Servlet.Forms services in Oracle Applications R12 are provided by the Forms Listener Servlet. 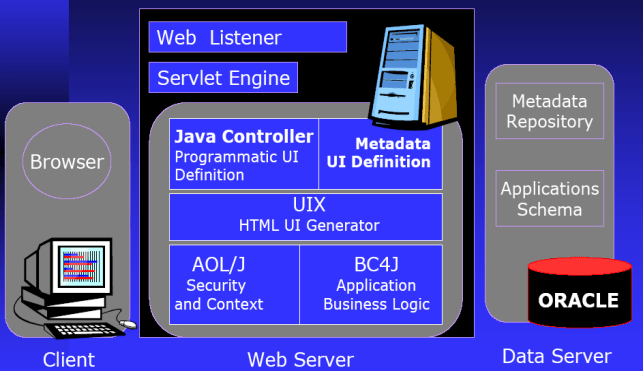 The Forms Listener servlet is a Java servlet that delivers the ability to run Oracle Forms applications over HTTP or HTTPS connections.The Forms Listener servlet is a Java servlet that delivers the ability to run Oracle Forms applications over HTTP or HTTPS connections. It hosts the Oracle Applications forms and runtime engine hosts the Oracle Applications forms and runtime engine. 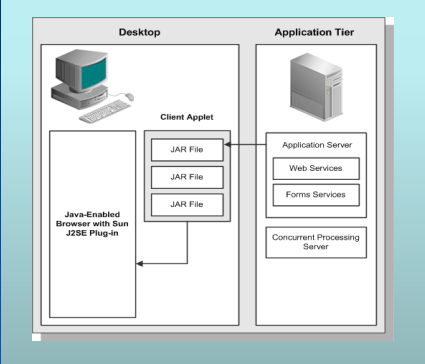 It communicates between the desktop client and the Oracle database server for displaying client screens.It communicates between the desktop client and the Oracle database server for displaying client screens. In Concurrent processing, the programs runs in the background while users continue to work on other tasks In Concurrent processing, the programs runs in the background while users continue to work on other tasks. Applications patches consist of files and scripts that update the file system and database objects . The AD Administration utility enables you to carry out this and various other file system and database maintenance tasks. Internal Concurrent Manager :- The Internal Concurrent Manager (ICM) controls all other concurrent managers. It administers the startup and shutdown of managers as defined by their work shift, monitors for process failure, and cleans up if a failure occurs. Standard Manager :- The Standard Manager will accept and run any concurrent requests, as it has no specialization rules that would restrict its activities. Conflict Resolution Manager :- The Conflict Resolution Manager (CRM) ensure that incompatible concurrent requests do not run in the same conflict domain. Summary :- Oracle Applications have three-tier architecture. They are comprised of a Database tire which manages the Oracle database and stores all data; an Application tier which hosts various servers, manages communication between the desktop and database tier and contains the applications file system; and a client Desktop through which users access Oracle Applications.